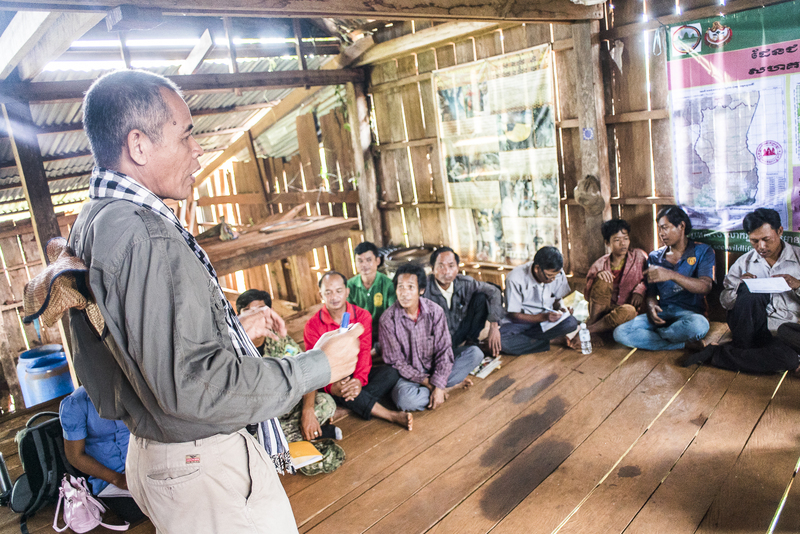 The nine Community Forests in Srepok Wildlife Sanctuary, which is part of Cambodia’s Eastern Plains Landscape, are all to be converted into Community Protected Areas. This is the result of a transfer in which the land’s administration was handed over from the Ministry of Agriculture, Forestry and Fisheries to the Ministry of Environment. While the name changes, the objective of the CPA remains the same: guaranteeing local communities exclusive right on sustainable use of natural resources, in return for management and patrolling of the area. This formal legal status has been created to avoid land grabbing by national or foreign private sector companies investing in large-scale agribusiness or carrying out mining operations. As such, CPAs provide local communities with secured land rights, though not ownership, and improved socio-economic conditions thanks to legal and managed access to natural resources. 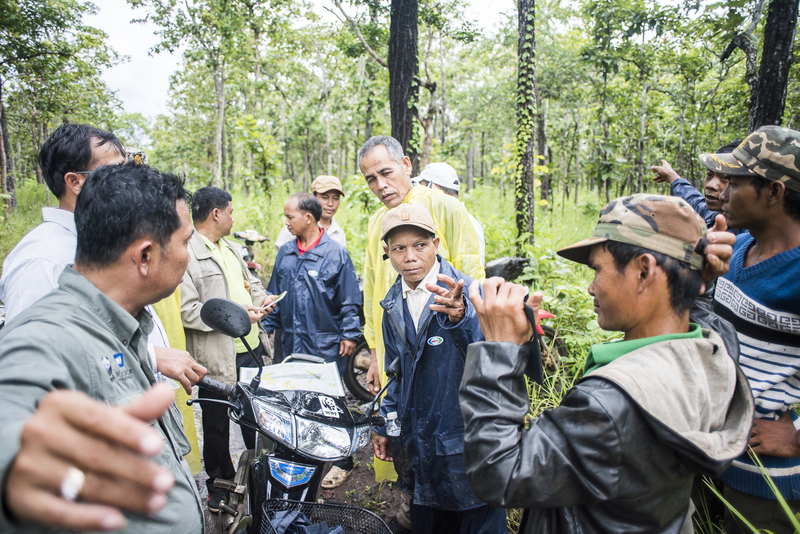 Organised community patrolling work allows the protection of the forest against illegal activities as well as the implementation of a management plan with ecological safeguards. Management plans of these CPAs, currently sized between 2000 to 9000 ha, foresee three management zone types. Firstly, a customary using zone, in which the extraction of non-timber forest products such as honey, resin, bamboo and mushrooms is allowed and cattle may pasture. Secondly, a conservation zone in which no domesticated animals or cattle are allowed. And thirdly, a reforestation zone in which luxury wood, whose occurrence became very rare due to illegal logging, is being replanted. Around 60% of every community’s inhabitants, which equals up to 300 families in each CPA, are involved in the voluntary programme. Illegal logging and resulting deforestation is still an important challenge to be tackled in the EPL. The CPA community rangers are being provided with cameras, hammocks, GPS devices, rain coats, walkie-talkies and gasoline expenses’ settlement. The costs are carried by NGOs at the moment, but community-based enterprises should cover some expenses in the future. In addition to that, the Cambodian government agreed on a payment of USD 1,000 per CPA. The exclusive decriminalization of non-timber product collection that indigenous communities have been carrying out for centuries and in return engaging inhabitants in sustainable forestry and nature protection does not only result in traditions surviving until today; the future-oriented approach ensures that they can be practiced in the future as well. On the occasion of the recent administration changes, from October 2nd to 15th, 2017, an 18-headed team, led by the Liaison Community Engagement Project Officer, Son Bora, visited every CPA’s local Community Committee and welcomed all involved inhabitants. In view of the promulgation of the official prakas (declaration) that makes the CPA’s legal, boundaries of each area were checked and confirmed by the MoE. WWF is looking forward to sustain this project in cooperation with the villages as well as its partners RECOFTC, MVi, NTFP-EP, with the generous financial support of its donors such as the BMZ and the EU.